Ask me for better price! 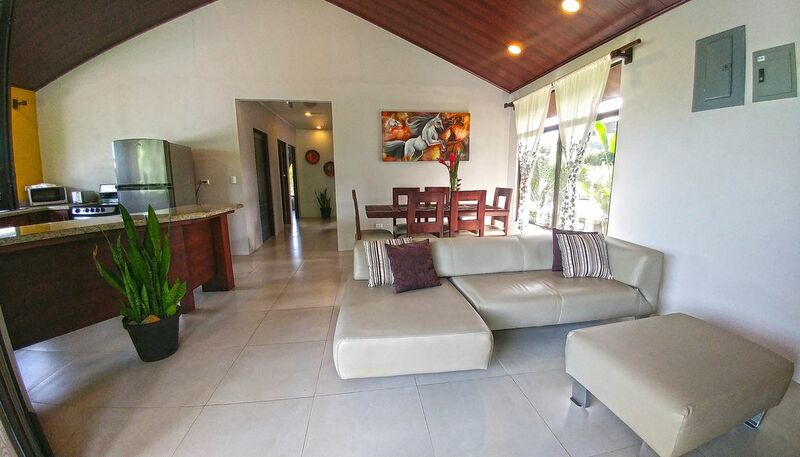 My place is located 10 minutes driving distance from La Fortuna where you’ll find good restaurants and dining. You’ll love my place because of the outdoors, the comfy beds, the ambiance with beautiful gardens and a fresh water creek flowing through our property. Our guests and service is focused towards our guests, usually couples, adventurers, business travelers, big groups, families with kids and furry friends. You will feel exceptionally relaxed after taking a siesta on the hammocks next to the creek with the cool breeze, listening to the flowing water and the birds singing. If you come to our place, I can assure, you will be experiencing comfort and luxury, with nature. You will enjoy and admire our beautiful collection of tropical flowers each of which represents the mystery and beauty of our tropical paradise. The houses were designed with our tourist and visitors in mind with accommodations and amenities trying to mimic your own private home. In addition, we can help with tour information and reservations, we were born and brought up in the Arenal area and know the best activities for your enjoyment. We pay special attention to details, cleanliness, order and preparation, we know how important this is for our guests’ enjoyment, specially when coming back tired and exhausted after a busy day, to find a clean comfortable place. To use Laundry room please ask Max. It can only be use once (with no extra charge) for a stayed of a least 3 nights. Low Season , May,September an October pay fee for laundry use. Granite counters and designed kitchen furniture. Beautiful crockery and everything to cook. 50.000 square feet of beautiful garden, enjoy more than 30 species of tropicals flowers. Users only Bukala Village guests. We are 4 Villas . Every other day house cleaning including, if you nee more please ask the owner. Max was excellent! We enjoyed the home, especially the pool. Very clean. Max was available to assist with bookings for local attractions. ALL his recommendations were great. Max and Magdelena were great to work with. Max booked several tours for us and made the process very easy. The gardens around the villas are beautiful. We did not have any trouble finding this location, we had been given GPS coordinates which is probably the best way of finding it. In the early morning we saw many hummingbirds right outside the door. Best place to stay in La Fortuna area! We absolutely lived staying at this VRBO! The place was wonderful with Max being the most gracious host. The place was clean with enough space for 3 couples. The grounds are lovely with all kinds of beautiful fauna and flora. We would definitely stay here again! Thank you Max and Magdalena! Really lovely. Max was brilliant, very helpful but not intrusive. Really knowledgeable. Booked some great trips for us. Thoroughly enjoyed our time in La Fortuna. Max and his family were great and helped us with activities and learning about the area. The grounds and accommodations at Casa Arenal were fantastic. Max takes great pride in his grounds and the flowers and plants were beautiful. Loved spending time on the deck watching the humming birds. Thanks Max and Magdalena for having such great accommodations. Mucho gracias. Dear Lois you were amazing guests, very carefully , friendly and easy to communicate with you! We hope you come back soon!!!! Stayed here for 4 nights while on vacation in CR with family (including kids under 10 years old) in early Dec. Rooms and beds were very comfortable. The A/C in the bedrooms were a nice touch in the evening especially on the rainy days (we had one day of full tropical rain storms). The kitchen / bathroom was fully stocked with all necessary supplies. Owner was super helpful and connected us with Max, who lives right next to the property on the date of arrival. Max and his crew also did some housekeeping mid-week, which was a very nice touch for a vacation rental. One word of advice...house was slightly off the main road from La Fortuna, so it might not be as easy for the tour buses to pick up (for any day excursion). We always leave Max's phone number with the tour operator so in case they need directions, they can communicate with him directly. On the day of arrival, we used Google Map to get there from airport and we were able to find it using GPS co-ordinates provided. The gardens and the pool were very well maintained. We thoroughly enjoyed the area and the quietness of this vacation rental....will recommend it to anyone visiting the area. Our area has amazing activities for all!